Our teams of knowledgeable agents are ready to assist you. Whether you are a first time home buyer, a seasoned investor, or ready to sell your home, LARKIN REALTY is here to guide you through the process. Our Real Estate specialists are members of the Vermont Board of Realtors and hold the highest standards of professionalism. Feel free to email one of our agents, or click here to view search properties in the MLS. LARKIN REALTY owns and manages several apartment complexes and single family homes in and around Burlington and South Burlington, as well as in Plattsburgh, New York. Our rental department will be happy to assist you in finding an apartment that is best suited for you. Click here to view a list of our available rentals. Gazebo Senior Living is a housing community featuring assisted living facilities as well as independent living options for seniors. The facilities feature on site nursing staff, food service, recreation, shuttle, housekeeping, and much more. For more information about our senior living, visit https://www.gazeboseniorliving.com. Our company operates two full service restaurants. Harper's is a family style restaurant with a full service bar located in the Holiday Inn at 1068 Williston Road in South Burlington serving breakfast, lunch, and dinner daily (except for lunch on Saturdays) and featuring an all-you-can-eat buffet style brunch on Sundays. For more information, contact 802-863-6363. 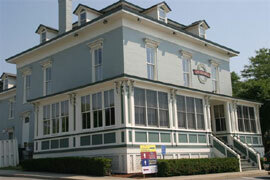 Lakeview House, located at 1710 Shelburne Road, features delicious lunch and dinner selections. The Lakeview operates Monday through Saturday for lunch and dinner, and also offers catering services for parties and banquets. For more information, call 802-865-3900.